As an example, the schematic illustration in Figure 4830 shows the bonding levels for diamond and indicates the Fermi energy level. When the hybrid carbon atoms bond, a second electron is contributed to the state by the other atom, and thus the interaction between the two electrons lowers the energy of the state. Therefore, the sp3 energy level splits into a series of four bonding and four antibonding orbitals. 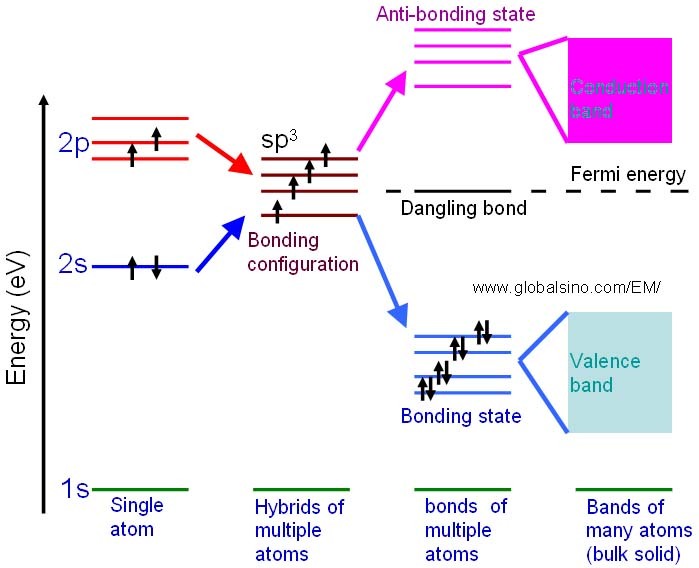 In an actual solid, there is a Coulomb interaction between the atom cores and the electrons, and then the bonding and anti-bonding energy levels split to form a continuous band structure, with the band of bonding states being the valence band and the anti-bonding states being the conduction band. Figure 4830. Schematic illustration showing the progression of the electronic structure for an sp3 bonded system. The sum EF (Fermi energy) and Φ (Work function) for metals is often of ~10 eV. Inelastic electron scattering means that an energy loss from scattering is big enough to be detected in the electron microscopes. Inelastic scattering is characterized by interaction of incident electrons with the electrons of atomic shells. In this case, the atomic electrons in materials are excited into higher free energy levels above the Fermi level EF or into the energy continuum above vacuum level (E=0). This excitation energy becomes an energy loss ΔE of the incident electron. The EELS feature corresponds to "core loss edges" or "edge onset" (ΔE = EF - EB), see Page 3437.